This modification will make your 700r4 shift from 3rd to 4th gear at WOT. The same as the B4C cars, and the $30ish dollar valve you can buy from Sonnax or others. This is my second time performing this mod, the first time I did it with the transmission in car, this time I did it out of the car. There really isn't and difference in difficulty between either. I am not responsible if you damage your stuff. This is also a good time to do a fluid and filter change, as you will be removing the pan. Drain your fluid and remove the pan and filter. 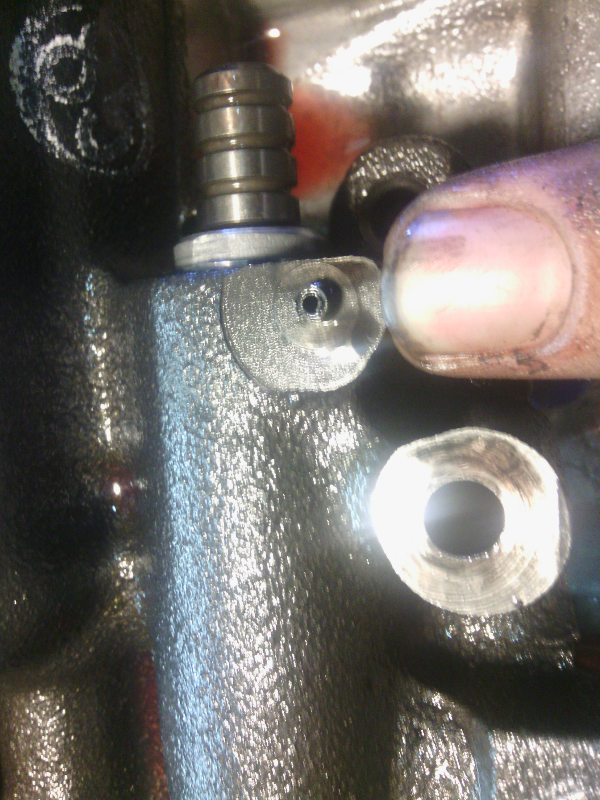 Remove these 2 10mm bolts. The bracket is right underneath where the TV cable comes into the transmission. Then remove this bracket holding the TV linkage. Be careful as the linkage that connects to the TV cable can come off. You can do this with or without the TV cable attached. 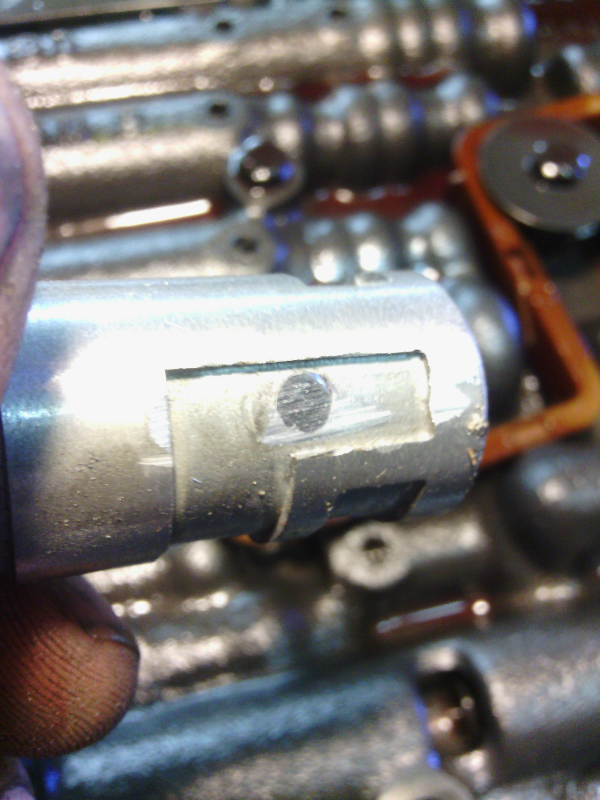 Remove this roll pin with pliers or needle nose, it should come out easily. If you pull on the inner TV plunger with your fingers the sleeve should come right out, if not you can GENTLY grab the outer lip on the sleeve and rotate while you pull it out. DO NOT grab the TV plunger with the pliers! I used 2 screws, slightly larger than the holes so when threaded in, they will grab real good. You can epoxy them in place, but if they are tight you don't really need to. 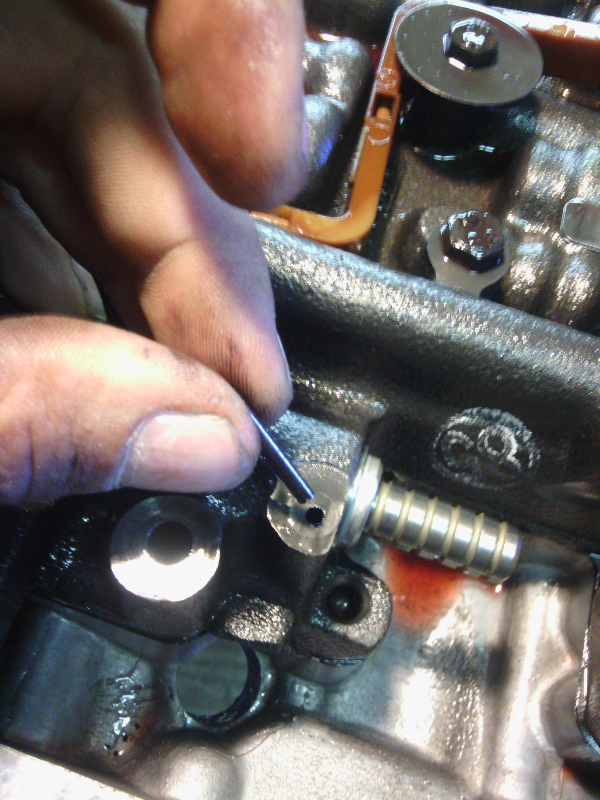 Make sure the threads do not stick out into the inner bore. To test this, use the inner plunger to make sure it does not bind. If it does, you can back the screw out, or use a needle file. 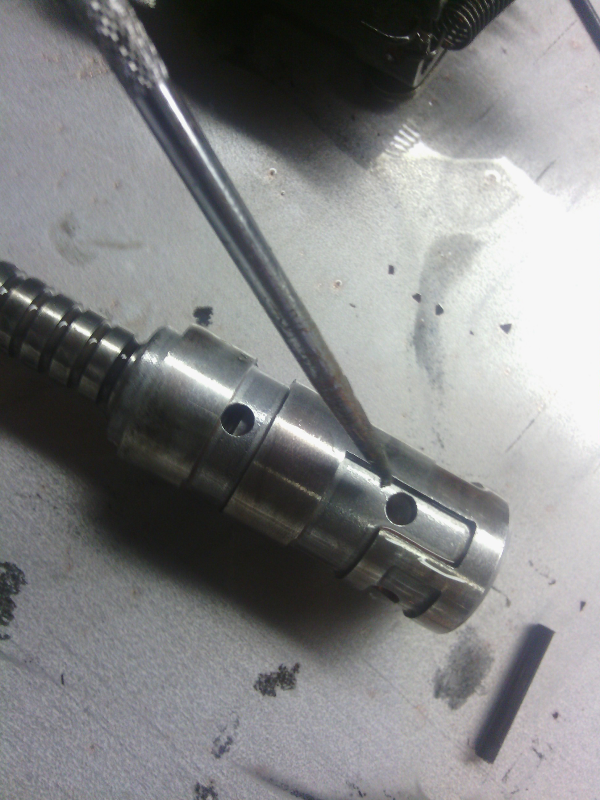 Next you carefully grind down the screws flush with the rest of the sleeve. Be careful not to do what I did and mess up the sleeve. In this case it will be fine as I didn't mess it up too bad. 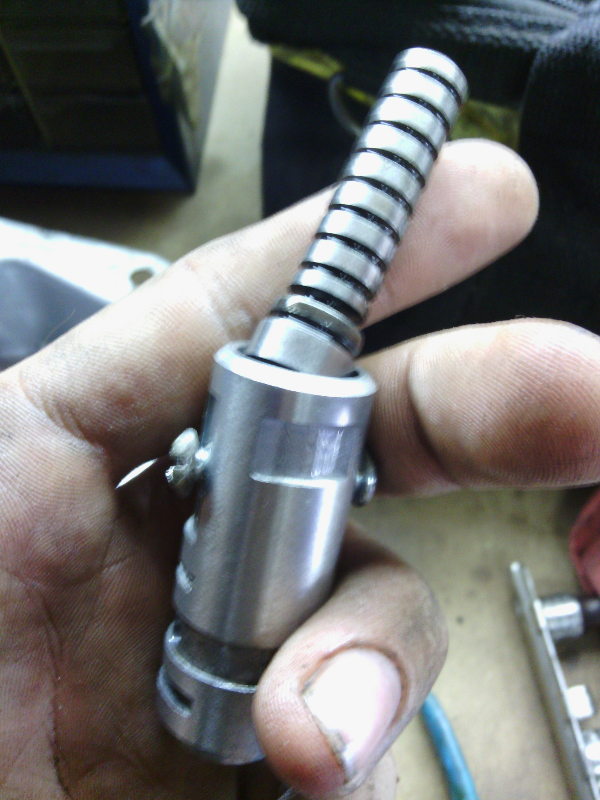 Once you are done, clean sleeve with parts cleaner and re-lube with ATF. Re-install the plunger into the sleeve and make sure it doesn't hang up in the sleeve. If it does use the needle file to clean the inside of the sleeve up. 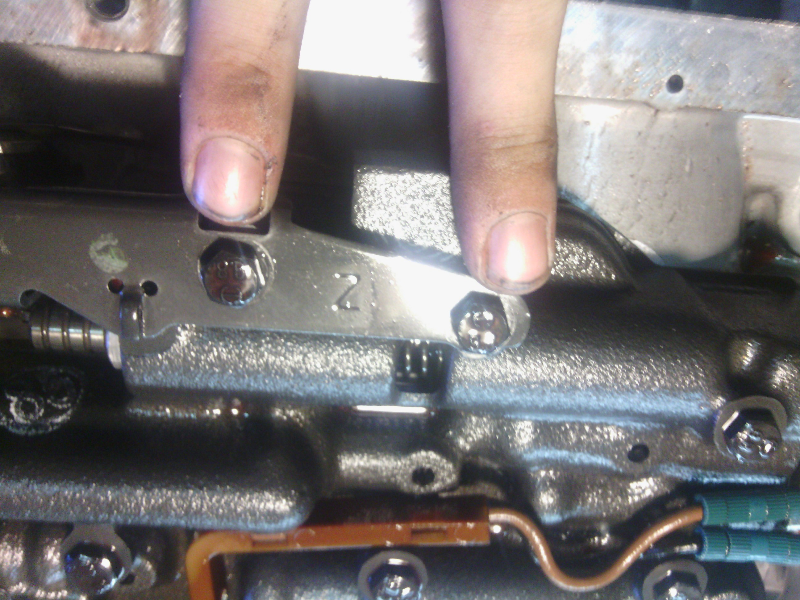 Here you can see the notch for the roll pin. 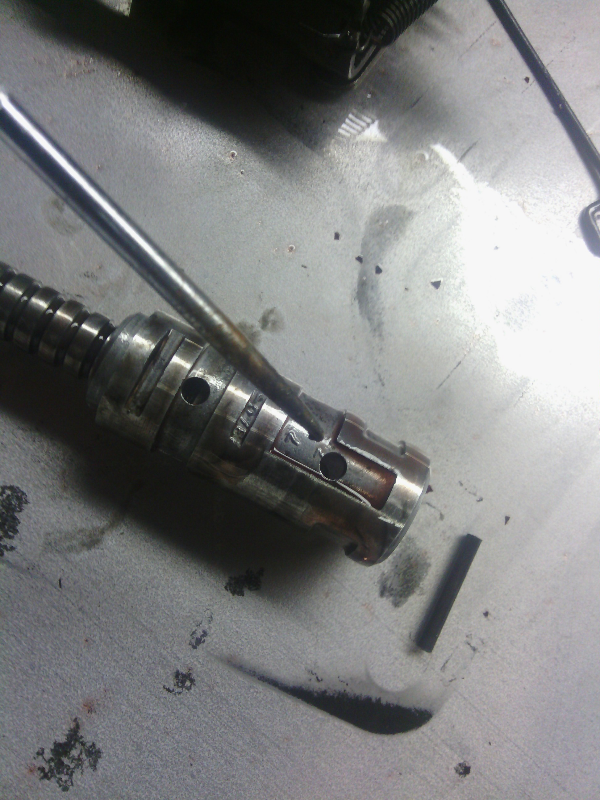 Re-install the sleeve and plunger into the bore and install the roll pin. Make sure the TV spring seats correctly, it should pop into place once you move the TV plunger back and forth into the sleeve. 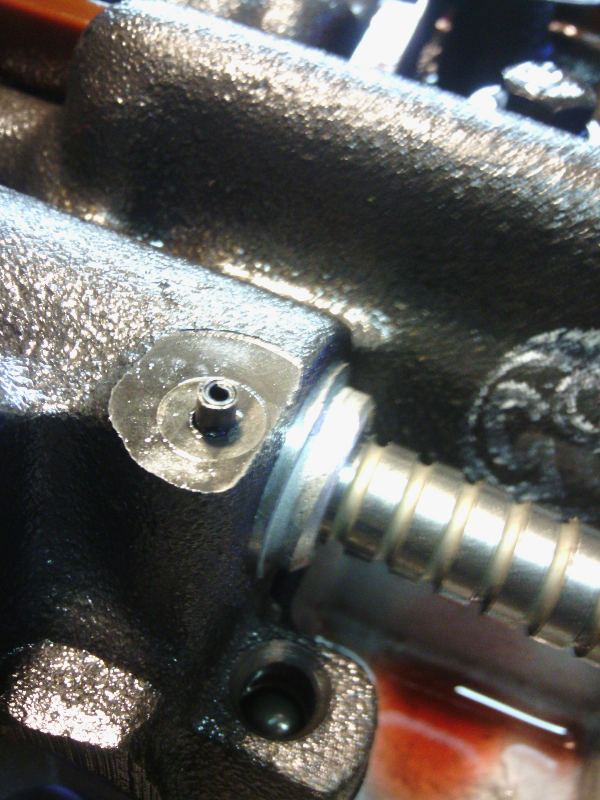 The roll pin will stick out a little, this is how its supposed to be, you can see where the bracket will sit over the roll pin. It should seat without having to tap the pin in place. 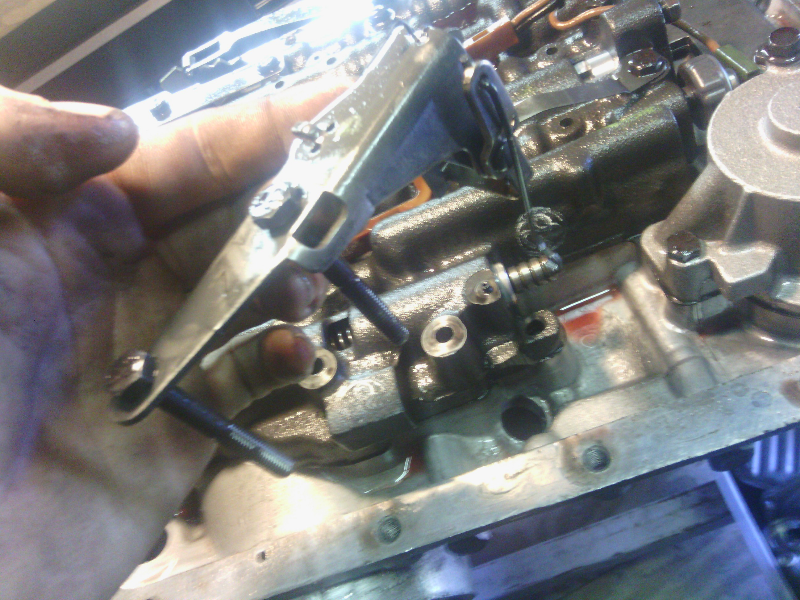 Once you get the pin in, you can re-install the bracket with the 2 10mm bolts. Make sure the TV plunger moves freely in the sleeve by moving the TV linkage back and forth several times. After all that, install your new filter, new pan gasket, the pan and refill your transmission. Check the fluid after running the first time with the car on to make sure the fluid level is correct. You will notice that above 85-90mph, you will never get a 4th to 3rd downshift unless you use the shifter to put it into 3rd. This prevents a high speed downshift. Under 60-70mph the trans should act as normal. This is me giving back to the community that has taught me so much about these cars. I am now passing some of that knowledge along to others. I am trying to get this stickied. Ask questions pertaining to the tutorial below but please do not clutter the thread. Last edited by willexoIX; 12-21-2014 at 11:07 AM. There's no good reason to into overdrive at wide open throttle. That may be the case in some instances, but why did they have these valves in the B4C cars? To get the WOT 3-4 shift to catch the bad guys. That is not what is being debated here. This is a tutorial to assist those who want this feature, nothing more. Ask questions pertaining to the tutorial below but please do not clutter the thread. Please save comments for questions pertaining to the tutorial or I will ask for the thread to be locked. I use small Allen screws that require nothing to be done but install them as they are small enough to require no grinding and fit tight enough so that they do not move. The price is approximately $1.00 for both Allen screws and the Allen wrench. With the right hole size in the separator plate and the right accumulation or no accumulation you can make a WOT shift and not wreck the 2-4 band. The stock 4th apply servo has almost the same apply area as the Corvette servo has for 2nd apply. If you have high horsepower and want to make 3-4 WOT shifts and have the 2-4 band live, then install the Sonnax "dual piston" 4th apply servo. To do this you should block the 4th accumulator. Drill the separator plate feed hold to .187" - .204". This will make for a very quick shift at WOT. The 10.5" or the 9.5" lockup torque converter should be used here. DO NOT lock up the torque converter clutch when making a 3-4 WOT shift as that will be hard on the gear train here. You can lock it after the shift if you are trying to get the highest top speed out of it. Are you saying you never shift past 4th gear with your manual transmission at full throttle? The B4C cars came with the WOT 3-4 package. GM used to sell the B4C kit for about $20. L98 and LT1 Corvettes have no problems making the shift into O/D as well. The modified plunger/valve that the original poster showed has more benefits besides a full throttle upshift into O/D. I remember driving through winding mountain roads at 70-90 mph one time. Accelerate, downshift....slow down for upcoming corner, upshift......Back on the gas pedal, downshift.....slow down again, upshift. That was with me leaving the shifter in O/D the entire time. I wished I could have just kept the car in O/D the entire time, as I would have had I been driving a manual transmission. But with the stock plunger/sleeve, there was no way around the upshift/downshift/upshift/downshift routine. With the modified setup, it would have stayed in O/D the entire time. At 100 mph with my 3.27 axle, that puts me square at 3000 RPM. Lots of torque in that area and unless you're racing, there is no need for a downshift at that speed. Once you get to around 120 mph, you'd be out of gear in 3rd anyways. So it's nicer to be able to keep the car in O/D at this speed. 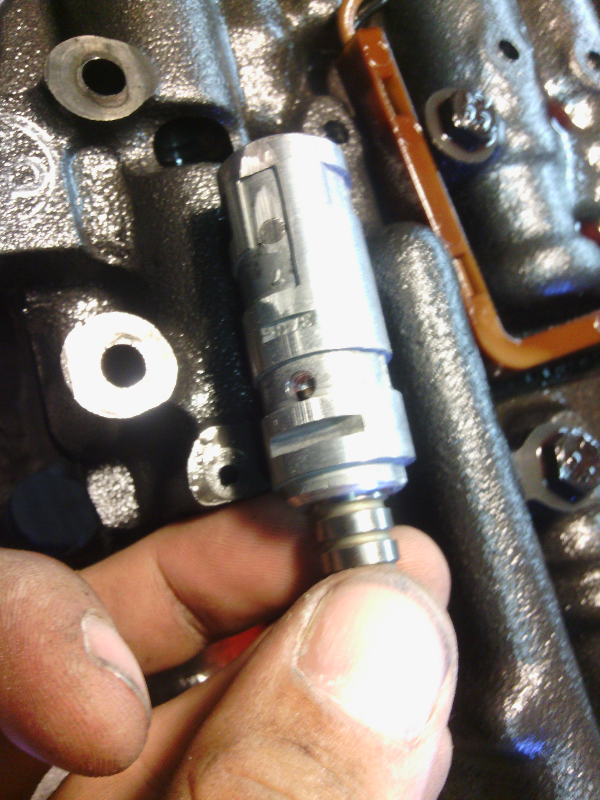 There is also the benefit that creeping along in O/D at 110, 115, 120, somewhere around that point, the car will downshift from 4th to 3rd no matter how much you feather the gas......This problem is eliminated with the modified valve. I really DON'T want the car to downshift into 3rd and be at the red line after the shift. There is also the ego part of me that doesn't like the idea that a bone stock 305 TPI 5 speed would have a higher top speed than my modified 350 TPI due solely to the fact that the automatic from the factory wouldn't make a full throttle shift into O/D. Mods, can I get this stickied? Dana and Reid, thank you for the additional information and thanks for keeping the posts pertaining to the topic. Last edited by willexoIX; 11-17-2014 at 09:27 AM. I have plenty of reasons to do it. Both my 83 G-van and 97 Express vans have hit 4th at WOT. 3rd tops out about 115 mph @ 5,000 rpm and the next gear keeps them trucking strong.